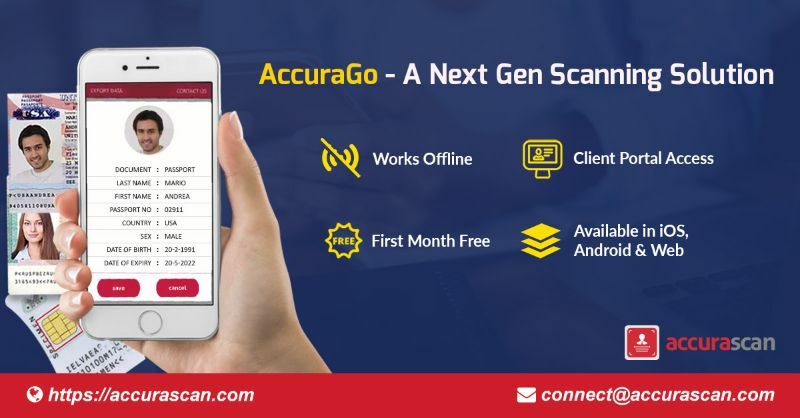 After the tremendous global success of the Accurascan app, a futuristic invention by Accura Technolabs, a Singapore based R&D company that deals in real-time computer vision technology, it has come up with a ready to use product- AccuraGo scanning solution powered by OCR technology. In the event of emergencies be it about travel, hotel booking, opening an account in a bank or a situation of security check-in, rarely we have the provision to scan essential documents on the spot. This is where AccuraGo comes to your rescue. Everyone has a smartphone these days. So, anyone whose phone, tablet or computer system is equipped with AccuraGo has a document scanner handy with him or her. This scanning solution will help you scan your documents like passport, ID cards, and visa anywhere anytime without internet connection. This is one of the most convenient features of the app. It can run on all three platforms - iOS, Android, and web. Since AccuraGo is a SaaS-based product, one can also scan documents by uploading the documents to its web portal. The average document recognition time of AccuraGo is even less than 500 milliseconds. Hence, even if you have too many documents to scan, it will take less time compared to other OCR scanning machines. The Id card scanner app works on OCR (Optical Character Recognition) technology. It uses the device camera to capture the image of the document. The OCR technology extracts the data from the document. Since the extraction of the details is done directly from the document itself there is no chance of any errors. So, you don’t have to waste time correcting mistakes or bear the consequences either. The app can read the documents at different angles and in low light too. AccuraGo is a paid scanning solution that can be used from the very day of its purchase. However, the first month usage is free. Start experiencing seamless scanning without any complex or lengthy process. Keep the app on your mobile or computer and reap the benefits of advanced OCR technology.